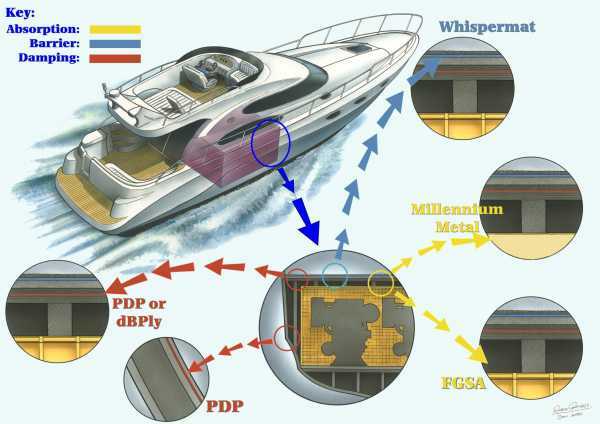 Sea Ray's "Quiet Ride Technology," which employs American Acoustical Products acoustic absorption, acoustic barrier and vibration damping products, won a Miami Boat Show Innovation Award for its ability to lessen the total noise and vibration level by 20 – 50%, depending on a person’s location on the boat. Click here to learn more about Sea Ray's Quiet Ride in a Boating magazine article. Photo courtesy of Sea Ray. 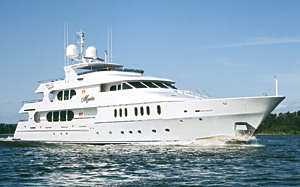 American Acoustical Products offers a full range acoustic absorption, acoustic barrier and vibration damping products for all sources of noise and vibration encountered in a private or class approved vessel. •	Enclosing entire engine rooms, mechanical compartments and interior components such as Gensets, inverters, pumps, HVAC systems. •	Noise, vibration and fire isolating floated floors, acoustic compartment panels and acoustic carpet underlayments. •	Hull slap noise, tank resonance, propeller wash and gearbox tones will be addressed. •	Anti-vibration mounts and couplings will be specified as required through our partners. •	Lower noise levels, using less weight then competitive mass-laden solutions by implementing our advanced material systems. •	Lower noise levels, using traditional class (ABS, USCG & Lloyds) approved constructions and materials. • One stop shopping for your vessel’s noise and vibration issues. • Half the weight of conventional treatments with improved quality of sound. • Exceptional product appearance and durability. • Expert team of creative experienced engineers. Contact us with your most challenging marine applications and we will listen to your problem and provide you with a solution that is reliable and effective.